... with homemade panettone and lemon frozen yoghurt. I am always late to the party. Don't know why, I just am! So not only did I manage to miss a big chunk of 'We Should Cocoa', I also managed to miss 'Forever Nigella' 1 and 2. So I was determined not to miss Number 3, and with unseemly haste (Nigella would be so disappointed, a ladylike saunter would be more her style) rushed off to Sarah's Maison Cupcake to check out the new Forever Nigella challenge. I was delighted to find that the theme was 'Ciao Italia', Italian cuisine has been a family favourite of ours, not least because its so classic and delicious, and usually on the quick side. I am, of course, talking about the pastas, pizzas and lasagnes that are a staple of our everyday dinners. And of course, Italian food is hands down the best comfort food in the world. To come back to my point, this challenge made me think a bit. I wanted to make something deliciously Italian, but didn't want it to be the usual Italian meals I cook. 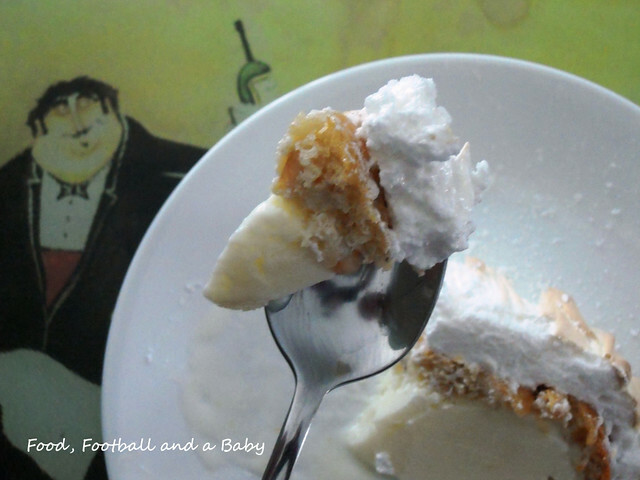 I browsed Nigella's website pretty thoroughly, and this lovely dessert caught my eye. Italian Baked Alaska! 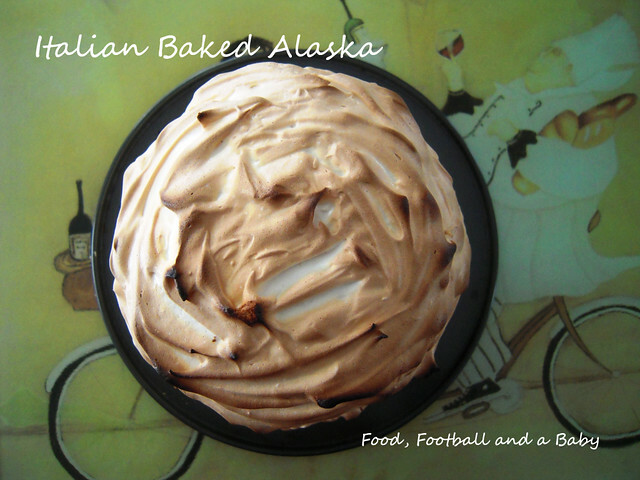 Now, as it turns out, Kay had been asking me to make a baked alaska for a while now. But I have always demurred, especially since I have never really been a good meringue maker. My first meringue around five years ago was a complete sticky, messy disaster, and I have never managed to find the confidence to make it again. But this time round, I decided it was time to conquer the meringue demons. So the Italian Baked Alaska was the target. Nigella's recipe was remarkably simple, but as usual, I have to go and make a simple thing complicated, right? Right. 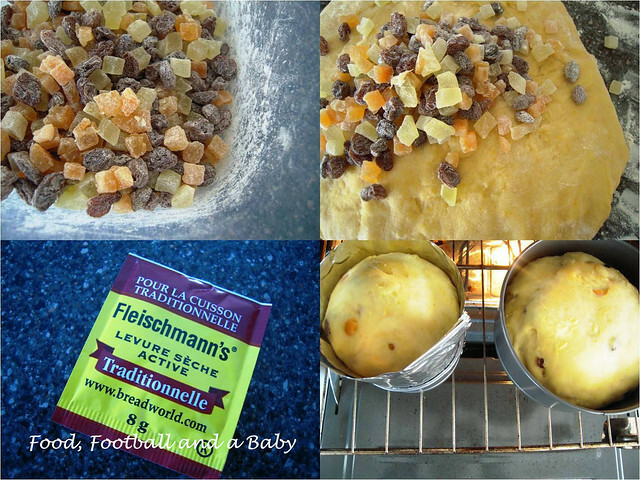 For the panettone, I used this Canadian Living recipe. The website has this neat bit where you can scale back the recipe to adjust the quantities. So, other than scaling back the recipe in half, I did not make any changes to it. I pinched off about a quarter of the dough, and baked it separately in a mini baking tin. The remaining dough, I just popped into a standard baking tin, and we had the panettone with tea. The panettone was fine, it wasn't the best or the lightest I've had, but it worked just fine for this recipe. 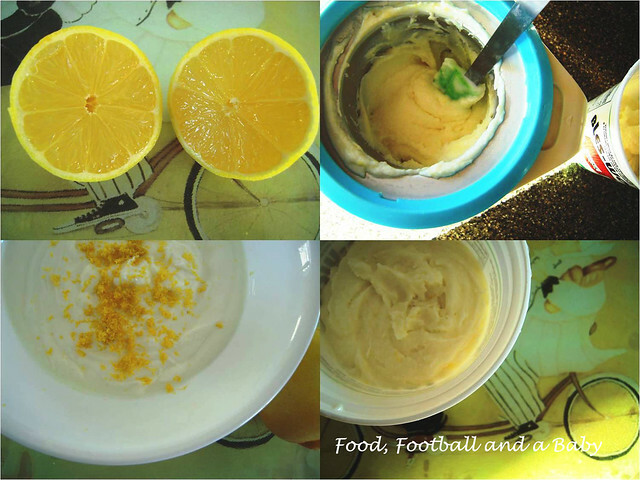 The lemon frozen yoghurt is adapted from this recipe by David Lebovitz (the third man I would happily desert my husband for, after George Clooney and Adrien Brody) I have posted this recipe as I made a few changes to it. Put the three cups of yoghurt into a cheesecloth draped over a bowl, then hang the yoghurt for up to four hours. You will be left with roughly 2 cups of very thick yoghurt after this step. Whisk in the lemon zest and juice, sugar and salt. 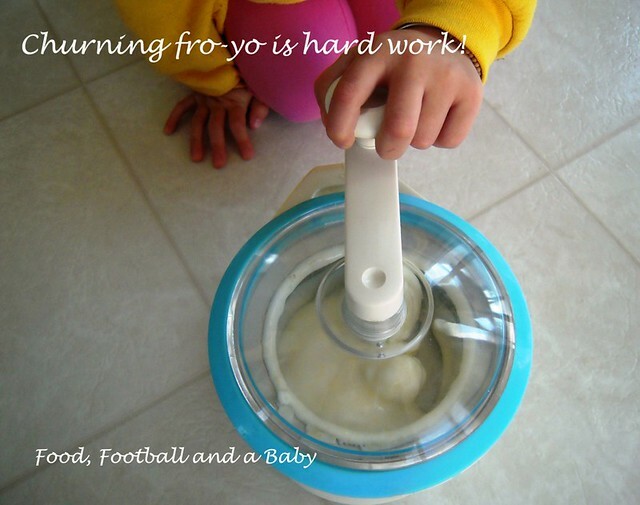 Churn in an ice cream maker until creamy. Pop into a freezer safe container, and freeze till ready to pop into the panettone. Slice the top off the panettone. Using your fingers, scoop out the insides (and eat), leaving a shell. 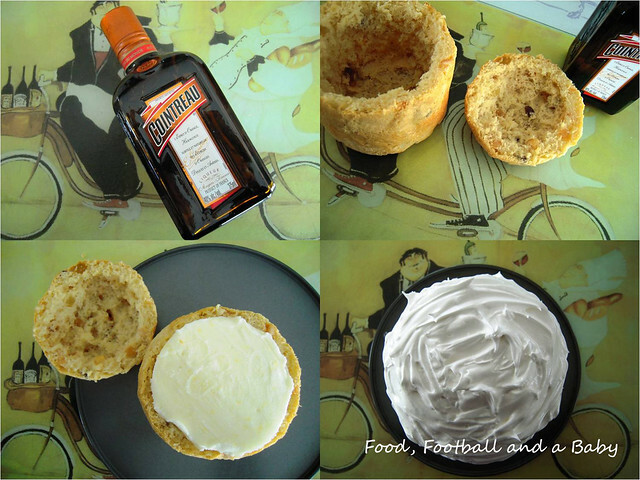 Sprinkle the Cointreau into the panettone shell. Now stuff the panettone with the lemon frozen yoghurt, packing it down gently, but firmly. Sprinkle more Cointreau over the insides of the 'lid', and replace it on top of the panettone. Put back into the freezer while you make the meringue. When all the sugar has been used up and the egg whites are glossy and stiff, use a spatula to layer the meringue over the frozen yoghurt stuffed panettone. Don't leave any gaps. At this point, you can freeze the assembled alaska, until you're ready to bake it. When you're ready to bake the alaska, preheat the oven to 200 C (400 F) and pop the alaska directly from the freezer into the oven. Bake for roughly 6 - 10 minutes (depending on how hot your oven gets, mine had been on all day, and was pretty hot, so cooked in roughly 7 minutes), until the meringue peaks start to brown. Take out of the oven, slice and serve immediately. This recipe is going to Sarah at Maison Cupcake's Forever Nigella Blogging Event. The theme for March is 'Ciao Italia'! Kasia, you should totally enter Forever Nigella. Sarah from Maison Cupcake is absolutely alovely, and you'll be able to introduce your blog to lots of Brit readers too. 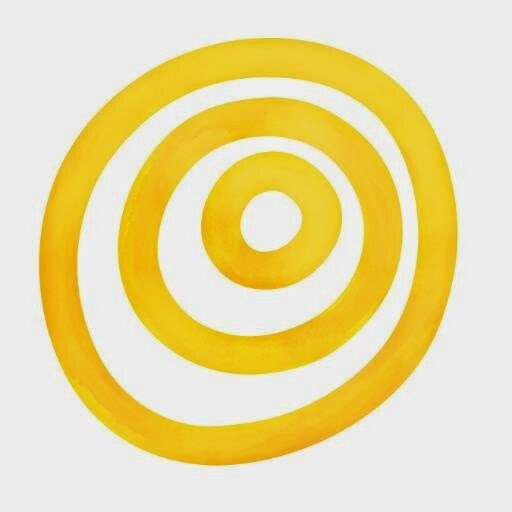 Just follow the links on this post, and also you can mention it on Twitter. Looking forward to your risotto! WOW! This is some really yummy stuff! A belated welcome to the Edmonton Blogosphere. You've apparently been here for quite some time! Make sure to introduce yourself at Eat Alberta - and, have you considered - or would you consider uploading Feedburner to your site so that I could get your new posts in my e-mail box? I do not use readers or feeds. Wow, I am impressed! It looks wonderful! 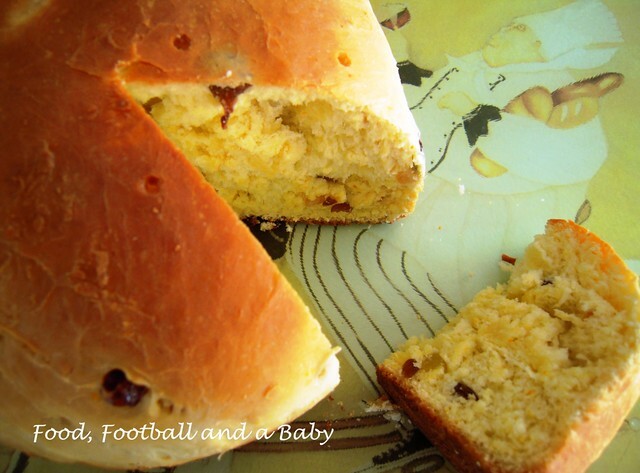 I am going to check out the Pannetone recipe, we love it. Have you ever made Pandoro? I bought the special mold but haven't done it yet! @Valerie, thanks. I have been blogging for a while, but mainly on the UK scene. When I realised my husband had no intention of moving back, I figured its time to make friends with Canada and Edmonton :-) You have a lovely community here, and I am really looking forward to Eat Alberta. @Kathleen, I love panettone. I haunt the Italian Centre here in Edmonton, they have some lovely loaves around Christmas and Easter. I haven't made Pandoro yet, but its on my list now, thanks :-) Loved your bright yellow tablescape, really cheered me up no end!! I've never made my own baked alaska always identifying it with some Findus 1980s type number but I absolutely LOVE the spin you've put on it here and am now imagining all kinds of versions of baked alaskas. Thanks so much for joining Forever Nigella 3 and I hope to see you again! @Meg, thank you :-) I loved that meringue cake you made for the Daring Bakers, its just inspired me to go and join them... cheerios! Adore the background picture of your molto impressivo baked alaska. I know this is a different event but you really are a 'daring baker'!